Friday night is usually movie night; a second hand DVD and a bottle of wine in front of the telly. But this Friday the action moved from the small screen to the Plaza de San Marcos in Tegueste where previously unseen footage of Pirates of the Caribbean was played out before our very eyes. Tegueste is a small, picturesque town in the northeast of Tenerife with a fanatical commitment to preserving its heritage and a definite bent towards the bizarre. 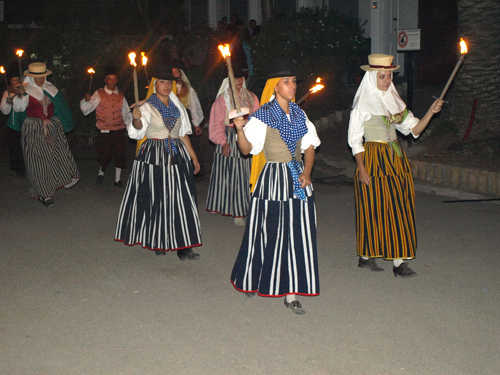 Many towns and villages on Tenerife hold a Romería during the summer, which coincides with the celebration of their particular Saint’s day and often has a history of some special favours bestowed by the Saint on the community. Tegueste is no exception. Except that, when in the 17th Century San Marcos ‘saved’ the town from the bubonic plague which raged all around them, where other towns offered the fruits of the earth in thanks, Tegueste built small galleons with white sails and, being entirely landlocked, ‘sailed’ them on wheels pulled by oxen. I rest my case. The Teguest boats feature in the town’s annual Romería, and once every 3 years, play a central role in the its Librea (salvation), which was where we were on Friday night. Arriving at 9 pm for a 9.30 pm start, the stands placed on three sides and in front of the church in the small plaza were packed to capacity and the square that circumnavigates the church was inches deep in sand. We made our way to the far side of the plaza where we had a reasonable view of the full scale castle that had been erected as a façade to the Town Hall, complete with turrets, battlements and cannon. At 9.30 prompt (I told you Tegueste had a penchant for the bizarre) the action began. in 18th Century costumes, the women carrying large bouquets of cut flowers in their arms as they ambled into the plaza where herds of goats, oxen and soldiers were gathered. 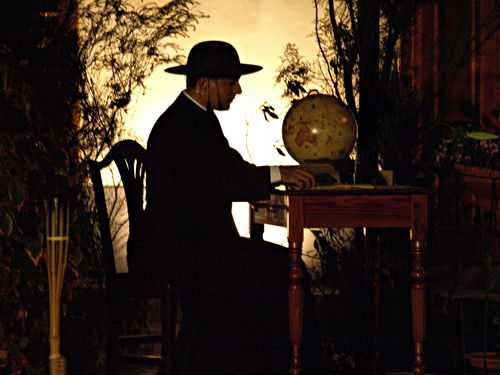 Narrated by the town’s minister; Prebendado Pachero, who was a key figure in its development at that time, a beautiful pageant unfolded of life in the sleepy agricultural town. Until, that is, a ‘boat’ arrived on the horizon (the street at the side of the church) and sailed (on wheels, pulled by oxen) towards the castle, followed by another, and another; the first manned by pirates, the second by Moors and the third by the English. All hell broke loose as the corsairs tried to take the castle and a mighty, heroic defence by the Teguesteros began. Unfortunately, as the ships sailed into the plaza, the Pirates of the Caribbean theme music blasted out from speakers and, with a Johnny Depp lookalike posing, sabre in hand, on the mast of the first galleon, I found myself resolutely on the side of the pirates; not I’m sure, where my allegiance was supposed to lie. The battle raged for about half an hour during which cannon fired on the ships, artillery railed from the battlements and the ships retaliated, all accompanied by laser beams frantically panning the sky, billowing smoke underlit by red beams, air bombs, rockets, stirring music and frequent casualties who were dragged unceremoniously from the scene of the battle only to miraculously resurrect and get straight back into the thick of the action. 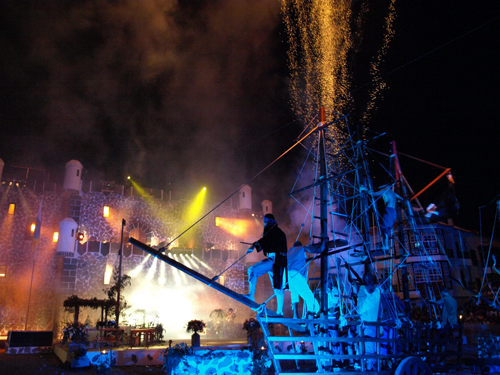 The battle for the defence of Tenerife's realm; all those in favour of the pirates, say "Aye"! When the pirates, the Moors and the English were finally driven away, there was a three lap retreat around the plaza by the ships at breakneck speed (one vessel nearly coming a cropper at the corner, being led by a young Teguestero who clearly has Ben Hur aspirations), a moving rendition of Ave Maria and a spectacular firework display set to stirring classical music, strangely, including Land of Hope and Glory; err, who won? And everyone wandered off into the balmy night with a head full of heroic deeds and not much idea of where and when they actually took place. Tegueste, a bizarrely lovely place.